Marital and partner bonds are also weakened by economic strain. The majority of families affected by incarceration are of low income (Mumola, 2000), and the men’s earnings are important for making ends meet (even though some of those earnings may come from illegal sources). At the time of their arrest, 61% of fathers incarcerated in state prison were employed full-time and 12% were employed part-time or occasionally. However, 27% of incarcerated fathers in state prison report that the source of their income in the month prior to their arrest was illegal (Mumola, 2000). 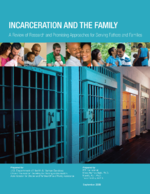 As noted earlier, 54% of fathers in state prison reported providing the primary financial support for their children prior to incarceration (Glaze & Maruschak, 2008). The loss of direct income can create a significant burden on struggling families, especially when it is combined with the additional costs associated with arrest and imprisonment, including attorney fees, collect calls from prison, and the expenses of traveling to the prison and providing material goods for the inmate (Arditti, 2005). According to qualitative research conducted by Arditti, Lambert-Shute, and Joest (2003), the proportion of women working actually declined (from 89% to 64%) after their partners were incarcerated because of the need for childcare and other issues. Furthermore, many women had to go on public assistance as a result of their partner’s incarceration. For single mothers, the stress of financial hardship has been linked with psychological distress, negative parenting behaviors, and poor child outcomes (McLoyd, 1998). Single parenthood due to incarceration is a role taken on involuntarily, and anger and resentment about this new situation may weaken commitment to the imprisoned partner. Parenting also may become more challenging because many children whose parents are imprisoned show elevated rates of internalizing and externalizing problems (Jose-Kampfner, 1995; Murray & Farrington, 2005). Many women with an incarcerated partner see a reduction in available social support to cope with the stress associated with their partner’s imprisonment as friends and family withdraw because of the stigma (Arditti et al., 2003). In addition, incarceration is marked as an “ambiguous loss” because the partner’s absence is not publicly mourned or socially validated. This can lead to exacerbated grief and the phenomenon of being a “prison widow” (Arditti et al., 2003).